Review: Phillips Avent Steamer Blender | Teefa Says..
i'm telling you i LOVE making baby foods for Afif. It took Mr. Chenta and i a while researching baby's food processor. It came down to Baby Bullet and Phillips Avent Steamer Blender. There are pros and cons, of course. Baby Bullet looks convenient but i know i won't be using ALL the fancy containers (and they will end up being unused) while some people say Phillips Steamer Blender does not steam well (the foods will still be undercooked). In the end, we decided to take our chance and chose Phillips. Hubby bought it at LittleWhiz at RM359 and it comes with Baby Cubes food storage for FREE! The steamer blender comes with a user manual and a recipe book, both i found useful. Different foods have different time and water level for steaming. For instance, carrot needs 150ml of water and 15 minutes of steaming while pear needs 50ml water and 5 minutes of steaming. Oh, you don't have to worry about measuring the water level because this baby comes with a special measuring cup for measuring. So make sure you check with the manual before steaming blending the foods to get desired result. After making baby foods a few times, you will automatically memorize the time it takes to steam different types of fruits/veges. 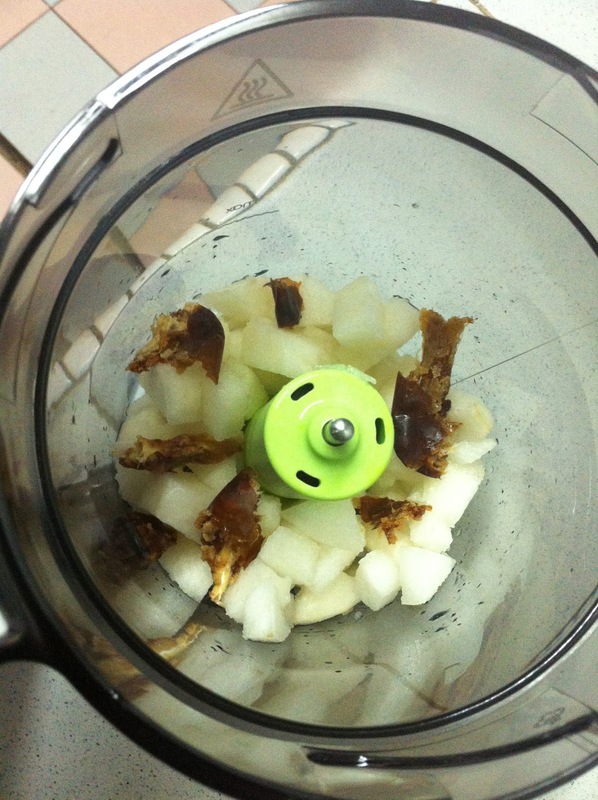 2) Put the ingredients into the steamer-blender container. Make sure the steamer side is at the bottom. 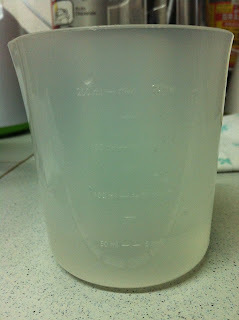 3) Fill water into the measuring cup and pour into the water dispenser. 4) Turn the knob to steaming mode. 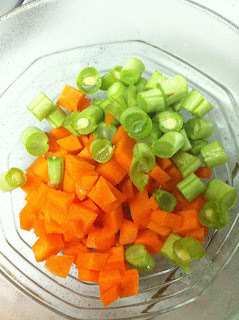 5) Wait a few minutes (depending on the type of vege/fruit) until you hear a "Tingg!" sound. It means the food is cooked and ready. The pear and dates are being steamed. 6) Turn the container upside down so that the blender blade is at the bottom. 7) Turn the knob to blending mode and blend until you get the desired consistency. 9) Store the extra puree into Baby Cubes and freeze. 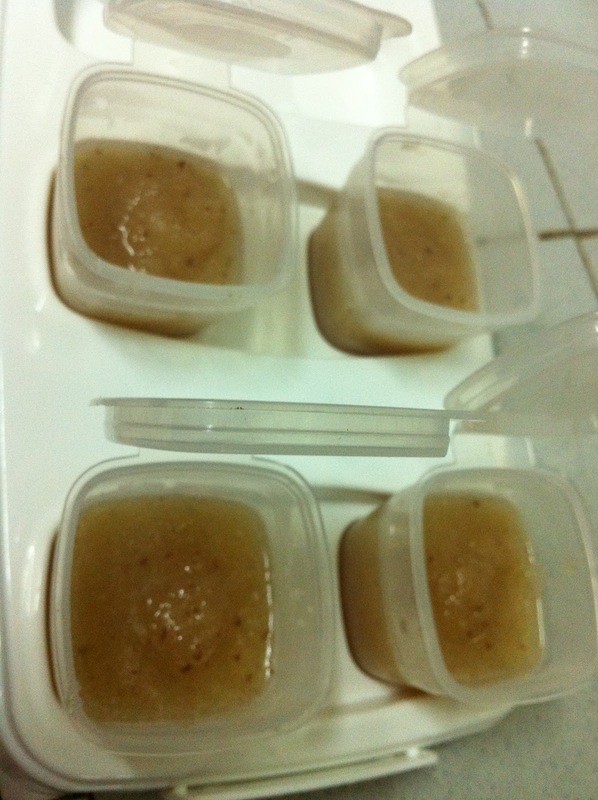 i always mix the puree with a little bit of milk so that Afif will still taste the familiar taste of mama's milk. Having used it for one month plus now, i encounter no trouble. 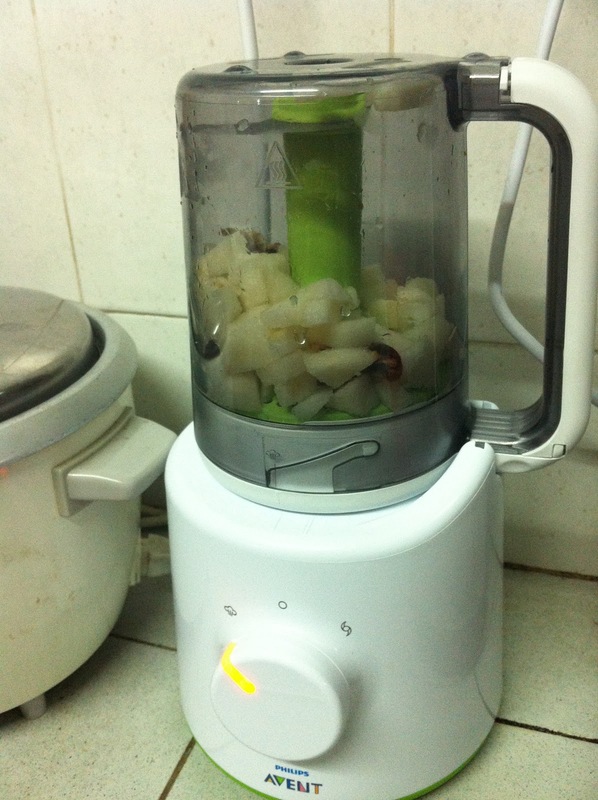 The fruits/vege are steamed thoroughly and it blends smoothly. i even made a simple pumpkin soup for myself once because i cut too much pumpkin for Afif alone. Really easy; steam the pumpkin along with an onion, add salt and pepper, blend then add cream or milk and serve! Tapi haritu buat pumpkin soup kureng sket sbb pakai susu HL. So rasa manis sket. Next time pakai cream. 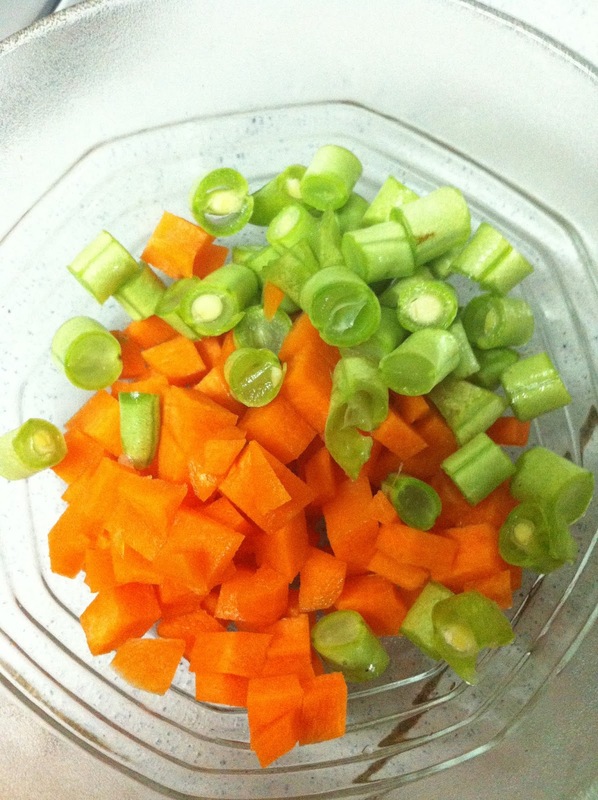 So far i have made carrot, pear, pumpkin-dates and apple-dates puree for Afif. i also have given him banana but that doesn't require steaming and blending. i just mashed it up with a spoon. He loves banana and pumpkin-dates the most. The others are okay laa.. Telan jugak sampai habis. In conclusion, i really recommend Avent Steamer Blender especially for busy mothers who want to feed their little one homemade foods. p/s: i blogged about feeding Afif rice cereal in this post. That was a mistake! i fed him that twice, dua kali jugak la dia meragam sakit perut susah poopoo. Sejak tu, bagi fruit/vege puree je tak penah lagi kasi nasik/cereal dah. 4 comments on "Review: Phillips Avent Steamer Blender"
Is Bubur nasi possible to be processed with this Avent product? What is the cons you found in this product? Any smell of plastic or water turn brownish? So far, there are no plastic smell or brownish water. You just have to make sure you clean it thoroughly before the first use, as instructed. 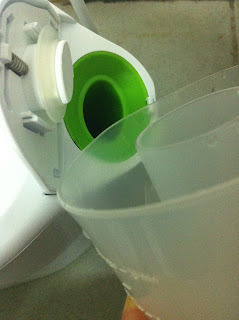 i used it frequently when my eldest boy started solid (in 2013), and started using it frequently about a month ago (when my second child started solid) and it still works perfectly well; blades still sharp, motor is running fine, still steams great. i have no complaints for this product. So far the cons is it has relatively a short power cable so make sure the power supply plug is near your table/kitchen counter.